With sadness and gratitude in our hearts, we announce the passing of our dear and loving Mother, Grandma and Oma, Anneliese (Ann) who passed away on October 13, 2018 at the age of 90 years after a lengthy illness. Mom was born on June 19, 1928 in Gelsenkirchen Horst, Germany, and was baptized in the Lutheran Faith. In 1930 Mom and Oma sailed the Atlantic to join her Dad who had left a year earlier to purchase land and a home in the Ellscott, AB area. Mom was confirmed at Golgatha Lutheran Church in Ellscott. This church was built by her Opa, brother-in-law and other early settlers. In 1943, the family sold the farm and moved to the sunny Okanagan Valley, settling in the Ellison district on an orchard. Ann helped on the farm and also worked for 19 years packing apples in the McLean and Fitzpatrick Packinghouse. Ann married Erich Hak in October of 1948 and they were blessed with a son, Ken, and a daughter, Marilyn. In the Fall of 1960 to the summer of 1970, Ann and Erich owned and operated Five Bridges Grocery store. From the summer of 1971, Ann was employed for 8 years at Peoples Food Market. 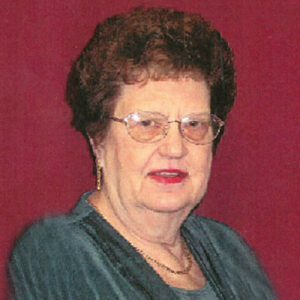 Ann had many hobbies such as knitting, needlepoint, ceramics, bowling and volunteering hours at many First Lutheran Church functions. For many years she loved to sing in the church choir. Ann is survived by her son Ken; daughter Marilyn (Murray) Forbes; grandchildren Michael, Jennifer (Simon), Steven and Nicole (JD); seven great-grandchildren; brother Herb Krause; twin sisters Margy Ruf and Hilda (Adolf) Meier; sister-in-law Frieda Splett; and many nieces and nephews. Ann is predeceased by her husband Erich in 2008, her parents, sisters-in-law and brothers-in-law. The Funeral Service for Ann will be held on Wednesday, October 17, 2018 at 2:30 pm at First Lutheran Church, 4091 Lakeshore Road, Kelowna. In lieu of flowers, donations may be made in Ann’s memory to the First Lutheran Church Memorial Fund, or a charity of your choice. The service for HAK, Anneliese (nee Krause) is scheduled for Wednesday, October 17, 2018 at 2:30 pm. Below you will find the map for the service location and the contact information should you have any questions.